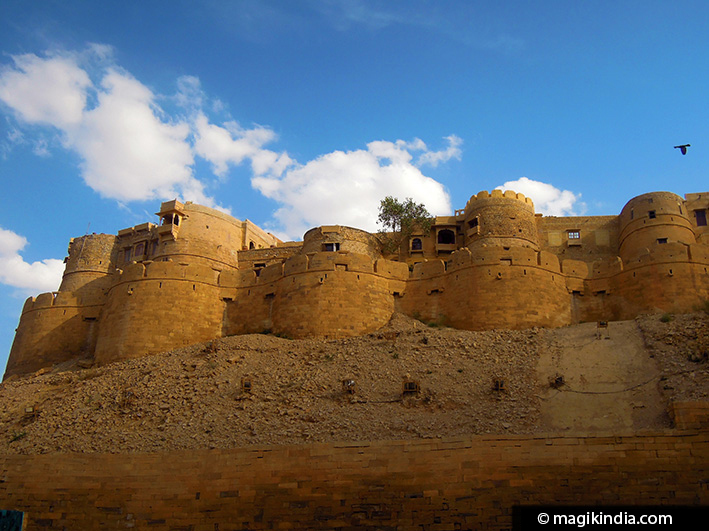 Tattooing and camel races, moustache contests, moonlight concerts among the dunes: for three days in January-February Jaisalmer, golden city of the desert, becomes a colourful showcase of Rajasthan folk culture exuding good humour and a friendly atmosphere. 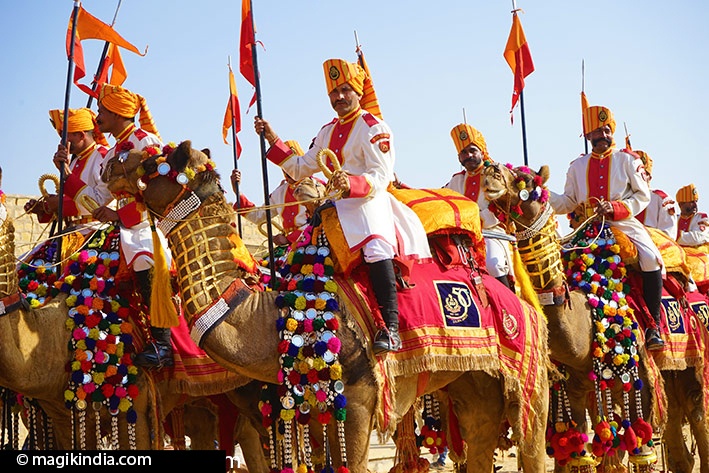 The festival starts with a parade led by the sumptuously decorated camels of the Border Security Force, starting at the fort entrance and ending at the Singh Shahid Poonam Stadium. 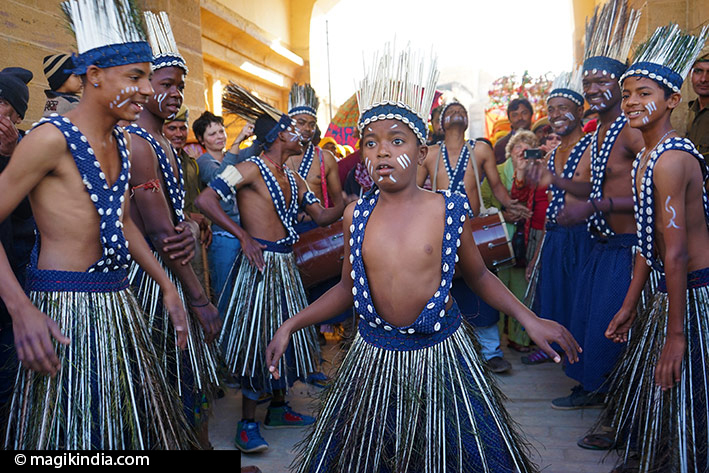 As the procession weaves its way through the old town’s narrow lanes, the performers stop here and there to put on a show. Dancers, bands and singers give their all, to the delight of onlookers and photographers. When the procession reaches the town stadium the audience is waiting. 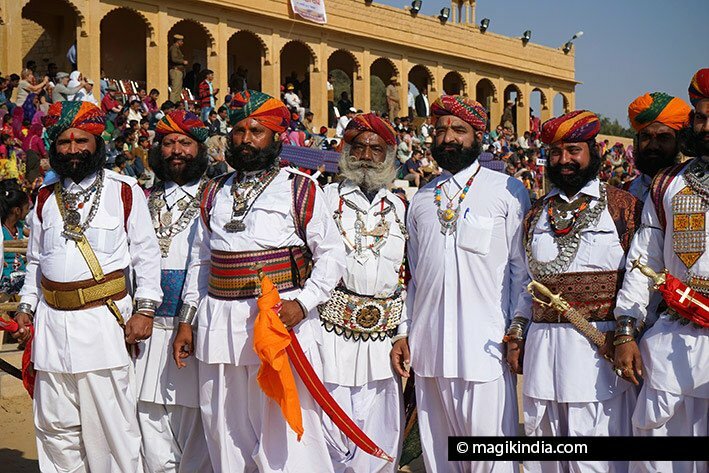 This is where the famous traditional Rajasthani competitions such as turban tying and longest moustache take place, as well as the Miss Desert and Mr. Desert contests. The day ends with a programme of music and dance. On the second day the festival moves out of town to the Dedansar Stadium. Dromedaries are decorated and tattooed, and there’s a panihari makta competition where women compete with pots filled with water balanced on their heads. 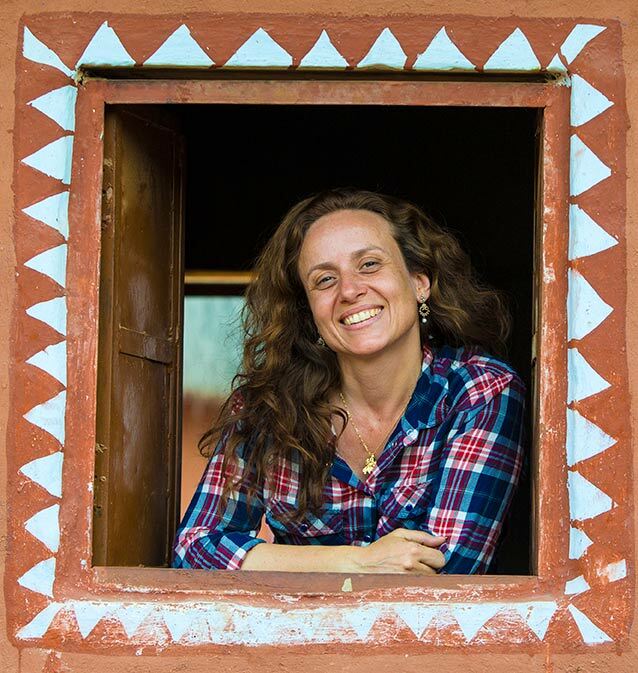 In that field tourists stand no chance against the poised and agile local women! 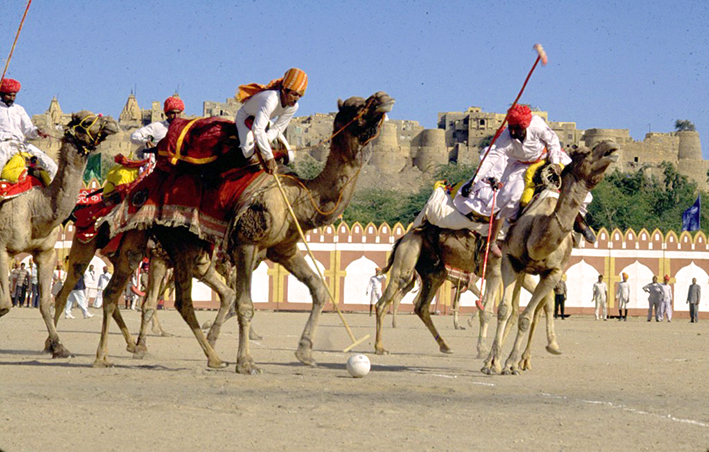 The high point of the morning is camel polo. Like the previous day, music in the evening. The last day takes place in the superb setting of the Sam dunes. 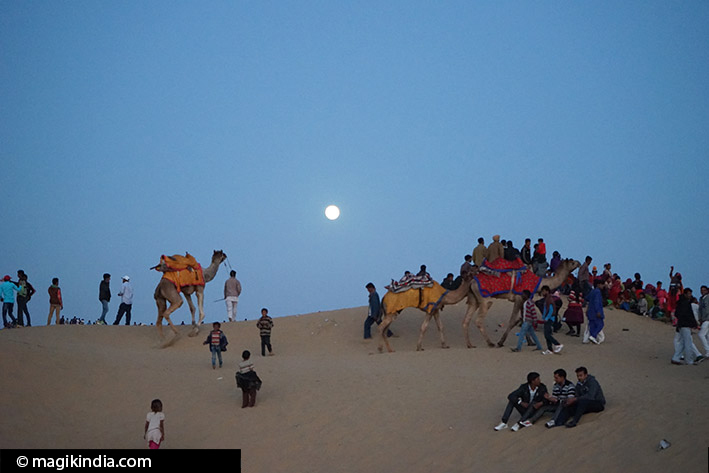 Camel races and camel rides are held in the afternoon and in the evening the festival closes with a concert of Rajasthani folk music beneath the stars. 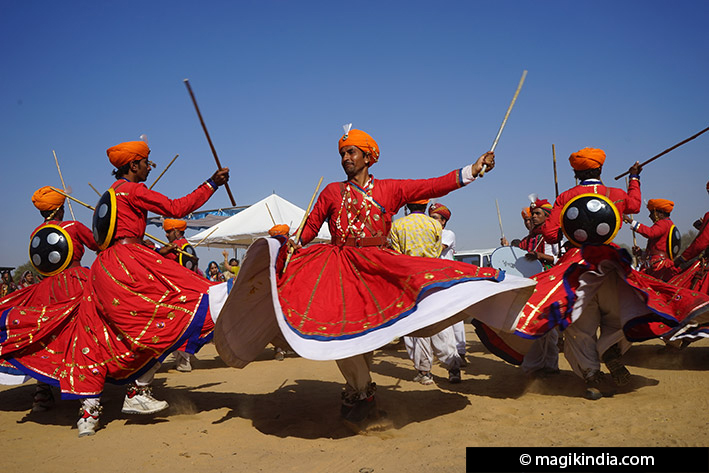 The Jaisalmer desert festival is an easy-going, friendly affair, a feast of colour that gives the visitor an ample glimpse of Rajasthani traditions.